Nearly every spring, I have to remove a nest or two of Eastern Tent Caterpillars (Malacosoma americanum) from the apple trees in our yard. This year appears to be a good year for the caterpillars as I’ve pulled four nests out so far. 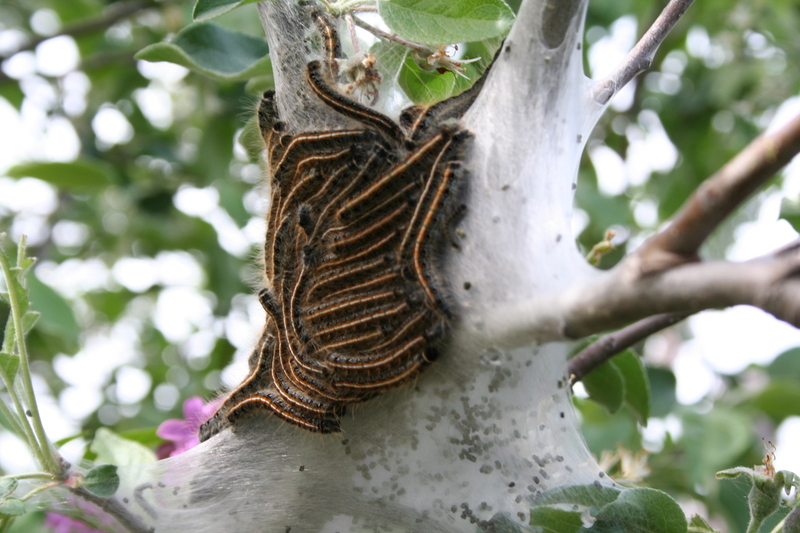 Eastern tent caterpillars build their silky, web-like nests in the crotches of cherry and apple trees. The caterpillars feed on the tree foliage for a few weeks before pupating into a moth. Ewww! Eastern tent caterpillars on my apple tree. While most sources say the caterpillars will not kill a tree, they can defoliate one pretty thoroughly, so I’ve generally tried to get rid of them. These caterpillars nest in groups and the nests themselves are interesting to watch as the caterpillars move in and out several times a day to feed. I don’t like to use pesticides, so I remove the nests (the best time is right before dawn or dusk when most of the caterpillars are at home) by cutting off the branch where the nest is and burning the nest. For more information on caterpillars, check this site out. Mary – We saw quite a few “tents” on young trees in the Arb on a recent walk, but I couldn’t see any caterpillars in or near them, only black dots. Perhaps they were all out and about? You certainly have a writhing mass there, it appears. The caterpillars are really quite handsome; it’s a pity they can be so destructive.